I had a baby five weeks ago, so this past weekend I finally decided it was time to clear the maternity clothes out of my closet. And although I can’t quite fit into my regular size, I wanted to at least make the closet ready for the time when things fit again. But as I packed all the maternity clothes away and started to unpack my normal clothes once again, I began to see my things in a new light, noticing things I had overlooked before: items that had small holes or were worn out, jeans with frayed bottoms, shirts from five years ago with the tags still on that just “never quite fit.” And as I noticed all of these flaws, I wondered, Why have I held on to these things for so long? In my moment of feeling motivated and empowered, I decided to get rid of everything in my closet that was mediocre, worn out, or never really fit well. And as I worked to remove the things that were always just okay -- but never great -- I thought, why did I settle for these things? In that moment, I realized that my closet mirrored the rest of my life. I’ve been known to settle for many things because I didn’t think I deserved something better. I didn’t think I was “smart enough,” “confident enough,” or "pretty enough". Scrolling through my memories, I recalled a number of times that I settled for something less than I could have. The boyfriend after college who was a “great Christian guy,” but would make offhand comments about how large my hips and thighs were, leading me to question my weight…I settled. Not speaking up for the position that I really wanted and just taking what was offered…I settled. Being my own worst enemy by not trying new things because I was too afraid and simply wanted to play it safe…I settled. And my closet was just another indication of a way that I have settled: “Maybe when I lose these last five pounds these pants will fit just right”…so I settled. I’ve settled every time I hang on to a clothing item that reminds me again and again that I don’t quite measure up. I’ve settled with things that never quite fit (and probably never will). But as I continued to pack things up, I was also reminded of the ways I’ve grown. I know that God has moved me along this process: I am not where I was, and I am moving closer to where I want to be. And as I took each item and began placing them in bags for Goodwill, I began to feel a little lighter, a little freer. Cleared out, my closet looked so much more organized, filled with things that fit right and looked good. 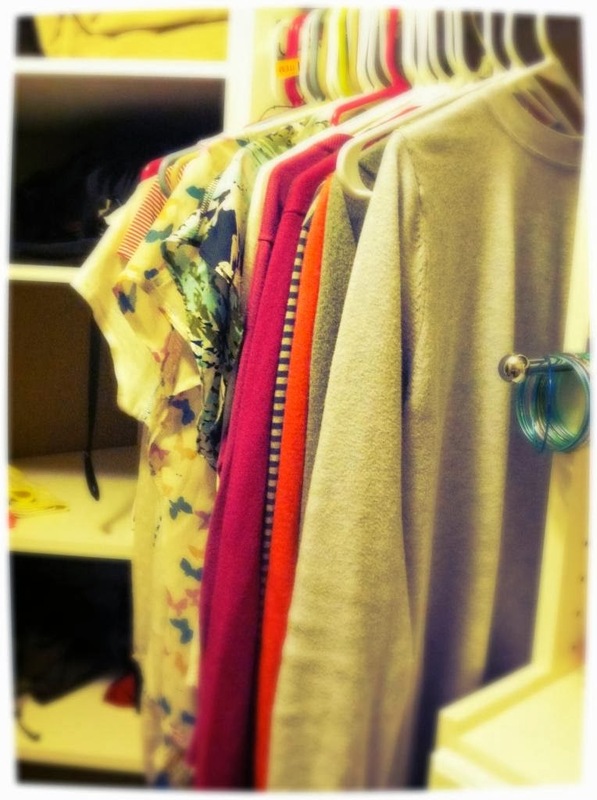 And as I continued the process of revitalizing my closet, I realized that it is how I want my life to look as well. I want to speak up for what I want. Go for goals that are wildly scary. And walk each day with confidence that God will give me what I need. What have you been keeping in your closet (literally or in real life) that maybe it’s time to let go of? "And as I worked to remove the things that were always just okay -- but never great -- I thought, why did I settle for these things?" Oh Kendra - This was so good! What a reminder for the things that I settle for - even settling for the idea that I should compare to others. Thank you for this. Let's join hands and go for the goals together that are crazy and wildly scary! Thanks for linking up and I hope you do again! SO SO good! Thanks for allowing me to link up with you! You are an encouragement to me! Blessings! Oh my goodness... this surely spoke to me today. Thank you for this wonderful encouragement. I'm so glad I clicked on your link over at Angie's place. Thank you for your kind words, I'm so glad you stopped by! Bless you!